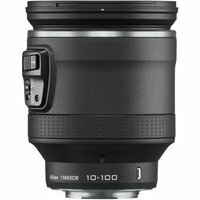 The Nikon 10-100mm f4.5-5.6 PD Zoom VR lens has been specially designed for use with the Nikon 1 interchangeable lens cameras. The 10-100mm lens features a powerful 10x (35mm equivalent: 27-270 mm) power-drive zoom and Vibration Reduction stabilisation system to allow sharp images to be captured when shooting hand-held. The lens includes a Voice Coil motor (VCM) for super-quiet autofocus performance, which is especially useful during movie recording. The retractable lens mechanism automatically retracts the lens when you power the camera off. The 10-100mm lens is always at the ready thanks to the lock switch, which enables you to keep the lens extended when you turn the camera off.